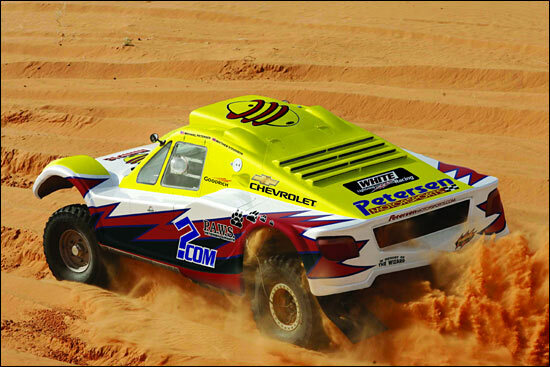 Petersen Motorsports / White Lightning Racing today announces that the team will enter the Dakar Rally in January, with a T1.1 Class buggy. Michael Petersen returns to his off-road roots to drive the machine, while Dale White is described as the programme manager, but he’ll also drive a T5 Class truck, one of the team’s chase vehicles. 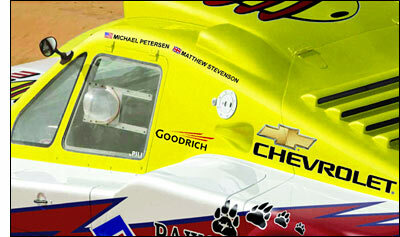 Petersen / White Lightning joins a substantial list of sportscar / endurance types who have taken up this challenge. Jacky Ickx, Jean Louis Schlesser and Luc Alphand are all previous winners in the car category while Henri Pescarolo is another racing legend who has been drawn to the desert event regularly in the past. Even the 1998 British GT Champion Kurt Luby has had a crack, in his case though it was an outing in the motorcycle event two years ago. The Las Vegas-based team has conquered just about everything in GT racing - Le Mans (’03 & ’04), the Baja 500 and Baja 1,000 overall (’95-‘97), Daytona (‘01), Sebring (‘05) and Petit Le Mans (’05 & ‘06). For the team’s first crack at the Dakar, they’ll be working with Philippe Gache’s Team SMG and Darren Skilton of Baja Automotive Adventures. The programme will move in-house in 2008, with Dale White then overseeing every aspect of the project, from the team’s base in Las Vegas. Baja Automotive is already constructing a pair of buggies for the team’s 2008 attempt at the Dakar. Michael Petersen’s driving partner in January will be Englishman Matthew Stevenson, who has ample experience in this event. The team will be testing the 2007 entry at the end of this month, in Morocco. The event starts on January 6, in Lisbon.